1) In a medium-sized bowl, gently toss together the peaches, tomatoes, onions, jalapeno, cilantro, lime juice, honey and salt. 2) Preheat the oven to 425 degrees F. Line a baking sheet with foil and lightly coat the foil with cooking spray. 3) Place the salmon fillets on the prepared baking sheet. Rub 1 ½ teaspoons olive oil over each salmon fillet and season with the salt and pepper. 4) Roast the salmon until just cooked through, 10 to 12 minutes. 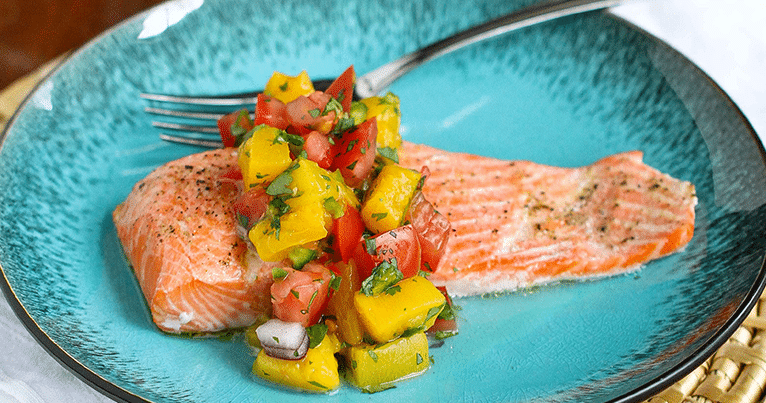 5) Place a piece of salmon on each plate and top with the peach salsa. Serve.